Hi friends! Hope you are all well. 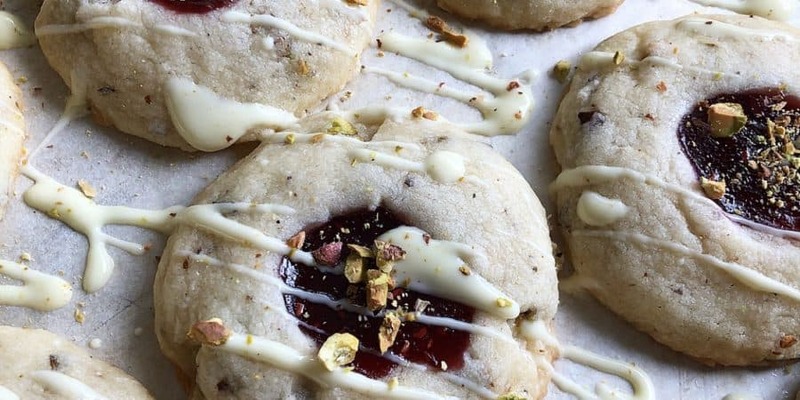 I’m super excited to share this Middle Eastern American hybrid of a cookie. This is one of the prettiest cookies to make in no time at all. It couldn’t be more simple to do too! It takes 5 ingredients and just a few steps to create absolute deliciousness! 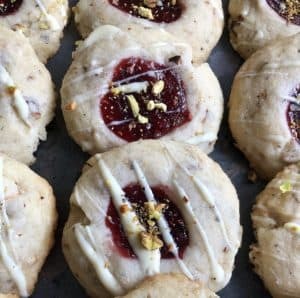 My mom loves to bake and she would often make ghoraybeh, which is a Middle Eastern shortbread. Often, it is just topped with one pistachio for decoration. 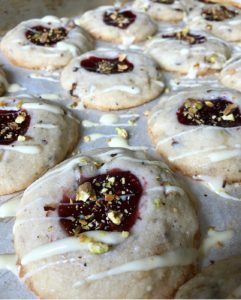 I decided to incorporate crushed toasted pistachios into the cookie itself to really bring out the flavor of pistachio which I have been recently loving! 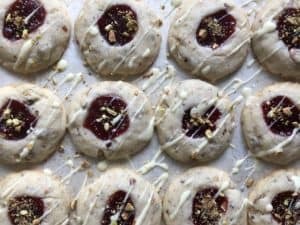 I took another step by modernizing this cookie into something we all know which are thumbprint cookies! I filled the indents with some yummy jam; which you can buy or easily make your own. Combine the sugar and butter in a large bowl. Stir with a rubber spatula. Add in the flour, 1 cup at a time to the sugar butter mixture. Mix together. Add in the toasted pistachios. *To toast my pistachios, I added them into a pan and toasted them on medium heat for a few minutes till lightly browning. Mix everything with floured hands so it doesn’t stick to your hands much. Form the dough into a ball and wrap with plastic wrap. Place dough in the fridge for at least one hour. Make 1 tbsp sized balls with the palm of your hands and place on the lined pan. You can make about 15-20 with this cookie dough. Once that is done, using your thumb make an indent in the center of the cookie. Add abut 1/4 tsp of jam into each indent. Bake in the oven for about 15 minutes. Cookie should be lightly browned on bottom but still light on top. Take out and completely cool. Drizzle with white chocolate and top with crushed toasted pistachios for garnish.